The Education and Public Engagement (EPE) Implementing Organization (IO) is dedicated to developing data visualization tools that will facilitate the use of data from Ocean Observing Initiative (OOI) to enhance undergraduate teaching. To enhance the utility and usability of these tools, a needs assessment performed with members of the undergraduate teaching community. 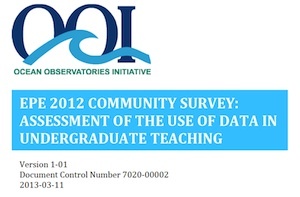 The Community Survey: Assessment of the Use of Data in Undergraduate Teaching was conducted by COSEE NOW team members and members the Education and Public Engagement (EPE) Implementing Organization (IO) to gather data on the practices and needs of the undergraduate oceanographic community. The objective was to 1) to quantify the number of undergraduate professors teaching ocean science and using data in their teaching, 2) some information on their teaching practices (how they were using data in teaching), and 3) information about their needs related to teaching with data in the ocean sciences. To learn more about this needs assessment and its findings, download the Survey Report.